Click on a link above or keep reading this page to learn about each of these outstanding units. Below, we discuss each pool cleaner’s unique features, pros, cons and common owner complaints. Rotate your phone for best viewing. 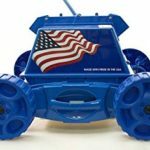 By its name and toyish look, it is easy to dismiss the Aquabot Pool Rover Junior as a lower-end robotic pool cleaner with few capabilities. The Pool Rover Junior comes with a handful of powerful features to ensure that your pool is left sparkling clean. It is a simple, proven workhorse that’s relatively cheap to repair. 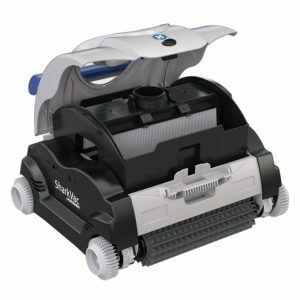 Though its cleaning power may not be tops among robotic pool cleaners, it does a great job for a great price. 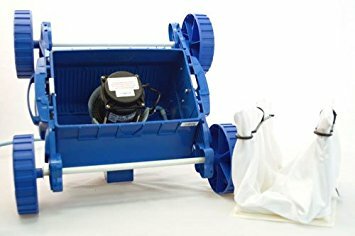 The Pool Rover Junior comes with most of the features you’d expect in a standard robotic pool cleaner: automatic timer, fine filter bag and an intelligent guidance system among others. This pool cleaner is designed for use on flat-bottomed above ground pools. 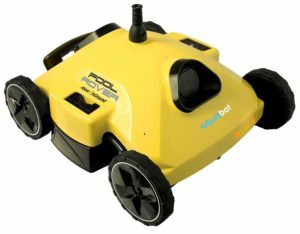 While most robotic pool cleaners take at least 2 hours to make a thorough cleaning, the makers of the Pool Rover Junior claim that it needs only 1 hour. 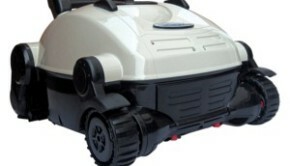 The non-marring wheels let the cleaner to easily roll over different types of pool surfaces for a thorough clean. 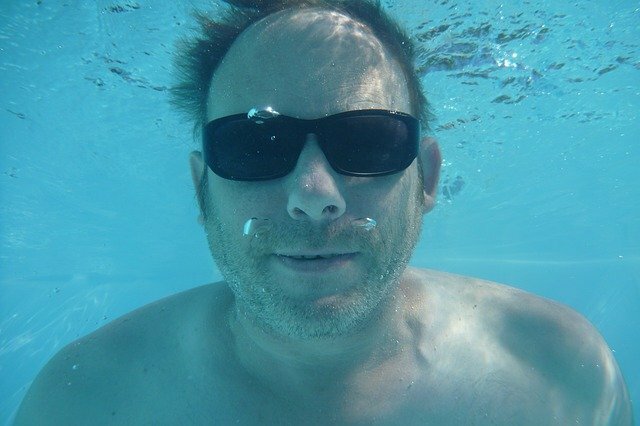 This is especially important for vinyl-lined pools. They also ensure that the cleaner does not get stuck in corners or on ladders. One of the features that make the Pool Rover Junior so efficient and quick is the internal guidance system. Once you set it in the pool, it figures out the quickest and most efficient way to clean your pool. This allows it to efficiently clean above ground pools of different shapes including L-shape, oval, kidney shape and rectangular without any problem. The 2-micron filter bag captures leaves and large particles as well as algae, bacteria and other smaller dirt particles. Only cleans the floor – no wall climbing capability. The Pool Rover Junior has been on the market for several years. It has hundreds of reviews on [easyazon_link identifier=”B001RLAKHO” locale=”US” tag=”roboticpoolcleaners05-20″]sites like Amazon[/easyazon_link], where you can read tons of pros and cons. You’ll see that many of the negative reviews are from people who tried to use this cleaner for in-ground pools (not advised). The most common complaint is with the quality of the material used on the Pool Rover Junior. Many customers noted that the plastic wheels and axles are weak and might not last very long. Customers also caution that the power unit should not be left outside since it is not waterproof. It can easily get damaged if it is rained on. 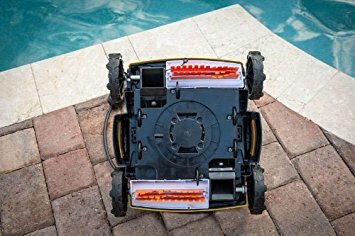 If you are looking for an affordable & proven robotic pool cleaner for your above ground swimming pool, you should definitely consider buying the Pool Rover Junior. The new Dolphin Escape is another excellent choice. Aquabot’s X-Large Breeze is designed for cleaning above ground pools and small in-ground pools of varying shapes. This cleaner is a good choice for pool owners looking for something with more quality than the Pool Rover Jr. but still affordable. It has its limitations, but it does a fine job. The Aquabot X-Large Breeze does well in both in-ground and above ground pools of different shapes. For in-ground pools however, it is only ideal for small-sized pools. It can clean an L-shape, kidney shape, round, rectangular or oval pool with a maximum length of 50 feet. The cleaner’s wheels can handle different types of surfaces including vinyl, tile, fiberglass and concrete. Cleaning out the Aquabot X-Large Breeze is no trouble at all. There are two large filter baskets with easy top access. Even better, the baskets have a clear cover making it easy to see how much debris has been collected. When they get full, just remove the filter baskets and hose them down. 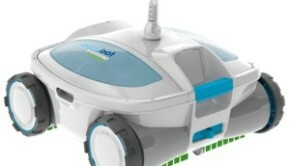 Unlike the Pool Rover Jr., the Aquabot X-Large Breeze does not solely rely on its vacuum to clean up debris. 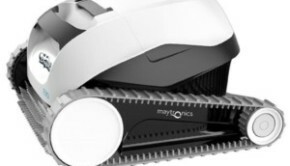 It also comes with two scrubbing brushes that make the cleaning process faster and more thorough. These brushes help agitate and loosen up dirt for easier pickup through suction. Furthermore, the robotic cleaner has power wash jets to loosen debris and ensure the pool is left as spotless as possible. To prevent tangling when cleaning a pool, the Aquabot X-Large Breeze comes with a swivel cable. This makes it easy for the unit to turn without the cable getting tangled up. If you read reviews on Amazon and dealer sites, you’ll see that most Aquabot X-Large Breeze owners are happy with their purchase. Most note the great cleaning performance and the low price. The Aquabot X-Large Breeze gets high marks for cleaning flat surfaces and portions of walls (with moderate success). The inclusion of agitating brushes and water jets is also appreciated by many customers. The one concern to note is that this robot pool cleaner takes a long time to clean larger pools. For standard pools, it requires just 1 hour but takes 2+ hours for larger pools. 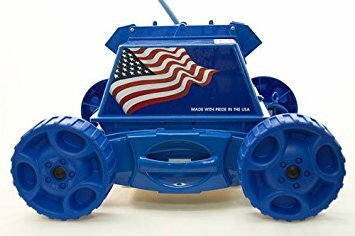 The Aquabot X-Large Breeze is nice a step up from the Pool Rover Junior. It has brushes, power jets, larger filter bags and a convenient swivel cable. This translates into better performance & convenience at a price that is still affordable. 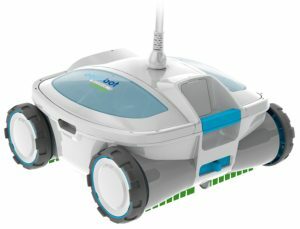 The Aquabot AJET122 (S2-50 model) is the newest above ground pool robot from Aquabot. It falls in the same price range as the Pool Rover Junior and Aquabot X-Large Breeze, but includes engineering improvements and filter options not found on the other two. Like the Aquabot X-Large Breeze, the AJET 122 works on both above ground and in-ground pools. For in-ground pools, however, it is limited to small sizes. There is nothing as annoying as a cable that keeps tangling as the cleaner moves in the pool. You have to take time after every clean to untangle the cable. Sometimes you even have to rescue the cleaner after it stalls in the middle of a cleaning session. The Aquabot S2-50 solves this problem by including a 50-foot swivel-cable that does not kink or tangle. The Pool Rover S2-50 has been designed to work on small in-ground pools and standard above ground pools. The Pool Rover S2-50 is equipped with Hydro-Robotic technology, which helps lower the maintenance cost of the robotic pool cleaner while improving cleaning efficiency. Hydro-Robotic technology refers to a mechanism where the robotic cleaner moves within the pool with the help of a strong jet propulsion from the in-built pump. The Pool Rover S2-50 features top access filter bags for easy access and cleaning. This unit comes with 2 sets of filter bags with fine and extra fine mesh options. The bags feature a nylon mesh filter that can filter out particles as small as two microns. 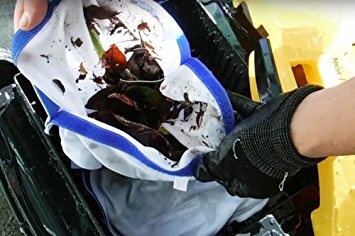 The extra-fine filter picks up the smallest debris and algae, and the fine mesh filter bag picks up larger leaves and twigs. The Pool Rover S2-50 comes with two scrubbing brushes. These brushes work to loosen up dirt and debris on the pool floor and walls, thus making it easier for the filters to pick up dirt. 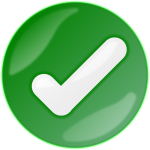 Most customers commend the cleaner’s ability to pick up most of the dirt, even the smallest of particles. The 2-micron filters work especially well, so if your pool suffers from sand and algae issues, this is a great choice. The no-tangle swivel cable is also a beloved feature for many customers. 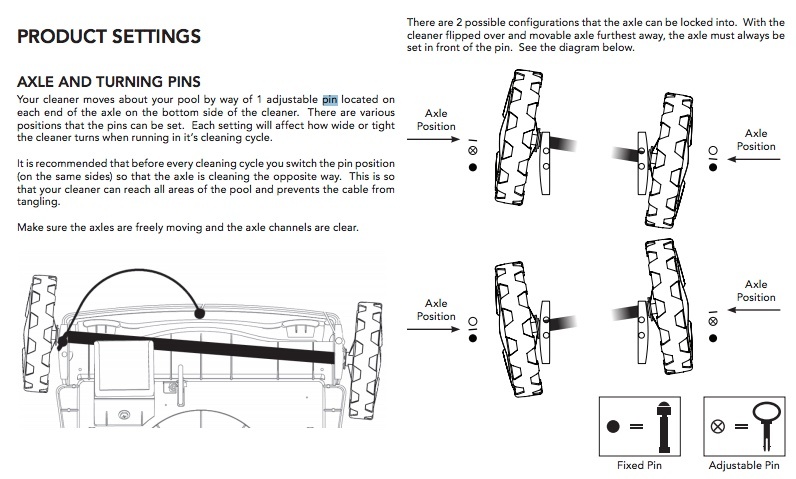 One area where some owners express frustration is the need to keep changing the pin configuration on the axles to ensure that the entire pool is covered. This issue is also shared with the Pool Rover, Jr. The Pool Rover AJET 122 is not the best pool cleaner there is. But it performs better than the Pool Rover Junior while still maintaining a really low price. 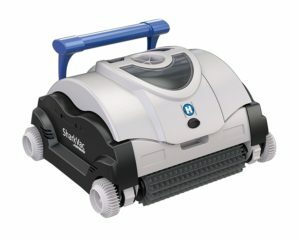 With a price tag over $500 (or $700 for an XL model) there is a lot to expect from the SharkVAC Robotic Pool Cleaner. And it delivers. Introduced in 2016, this is the latest model to be in the Hayward TigerShark family. It comes with some great features and is highly rated by owners. 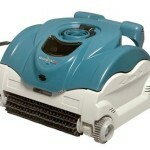 Please note that there are several variations of the SharkVac cleaner. You can get the standard size or the pricier extra-large (XL) size. You can also opt for one with a caddy cart, though it may cost you more (shop carefully – prices on the caddy combo deal change often). The SharkVac by Hayward is easy to clean thanks to its top access debris container. When in need of a cleaning, just pop open the top, remove the filter cartridges and clear the debris. There is no need to deal with messy bags or to turn the unit upside down. In addition, the SharkVac has two ultra-fine filters to catch the smallest of particles and leave your pool sparkling. To deliver a thorough cleaning, the unit comes with two scrubbing brushes whose purpose is to loosen stubborn dirt for easier filtration. The SharkVac contains advanced microprocessor technology that helps it navigate the pool surface as efficiently as possible. This ensures that every point on the pool floor has been reached and sufficiently scrubbed in just 2 hours. For an even more thorough cleaning of the waterline and walls, the company recommends using the SharkVac XL. Another piece of technology contained in the cleaner are the sensors. There are two types of sensors. One set detects when the unit is out of the water and protects the motor. The other detects when the unit begins to climb out of the water and responds by reversing direction. This is one of the strongest selling points of the SharkVac. 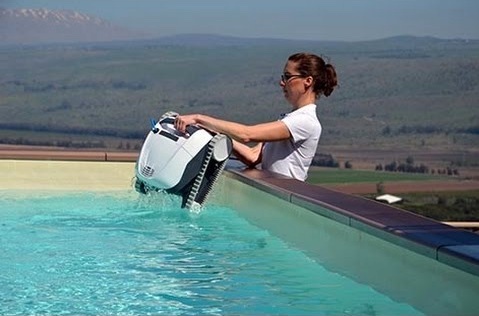 This robotic pool cleaner is designed to be highly energy efficient, using very little power on each cleaning cycle. In fact, each 2-hour cleaning cycle uses the same amount of power as a light bulb left on for the same amount of time. 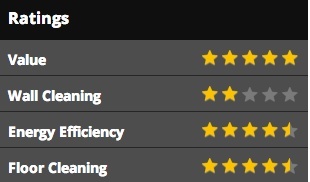 Customer feedback is overwhelmingly positive on the Hayward Sharkvac. This really is one of the few robotic cleaners to actually work as advertised. It collects debris, employs smart technology for efficient cleaning and is really energy efficient. Best of all, it is far cheaper than similar-performance higher-end models. The only concern most customers has is that some parts – especially wheels and the power cord – fail early. After a year or so, you may have to contact the manufacturer for replacement parts. Despite its relatively low price, the SharkVac is by no means a low-end pool cleaner. It has most of the features of high-end models and the cleaning performance is just as admirable. 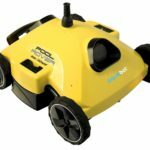 This is one of the best robotic pool cleaners you will find in the $500 to $700 price range, excels at cleaning flat surfaces – and it’s easy on softer materials. Cleaning a pool with a brush is a grinding task that will take up all your precious time. Even if you use a cleaner that relies on your pool pump, you most likely still have to clean the steps and walls yourself. A robotic pool cleaner does this for you. A good one will not only scrub the floor, it will also reach the hidden corners, tackle the steps and even climb on the walls for an all-round cleaning. A traditional pool pump-driven cleaner tends to require many parts and is expensive to install. A robotic pool cleaner comes ready to use without requiring any additional parts or installation. Just plug it in and it is good to go. Furthermore, modern robotic pool cleaners are designed to be highly energy efficient, ensuring you spend as little money as possible on your power bills. 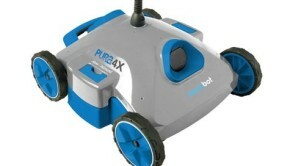 It is without doubt that a robotic pool cleaner does a much better job of cleaning your pool than any other method. Most cleaners use a combination of scrubbing(agitating) brushes and a vacuuming mechanism to ensure a thorough cleaning. A cleaner pool not only looks good but is safer for everyone who uses it, especially children. If you have an above ground pool, make sure you buy the right robotic pool cleaner. It needs to excel at cleaning flat surfaces and has to play nice with softer surfaces. Be careful not to spend too much, either. Most robot cleaners designed for an inground pool are more expensive, because they have to deal with more complex surfaces and lots of steps. Instead, look for units designed to clean above ground pools. 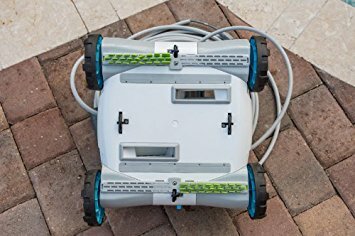 Compared to a traditional pump-driven unit or a manual pool brush, an above ground robotic pool cleaner will save you energy, money and time. Most importantly, robotic pool cleaners will probably do a better job of cleaning your above ground pool over time than a traditional pump-based cleaner will – or even most humans (given our tendency to miss spots). The bonus: robot pool cleaners for above ground pools are less expensive than cleaners designed for larger in-ground pools with more complex shapes. 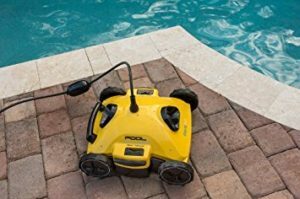 In this buying guide, we review the best four robot pool cleaners designed for above ground pools. 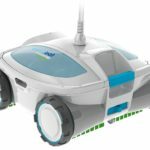 Three are from Aquabot, the first brand to specialize in less-expensive above-ground robotic pool cleaners. The 4th is from Hayward, the leader in higher-priced and more sophisticated in-ground pool robots. As usual, we limit our top selections to pool cleaners that have been on the market for more than a year, because durability is a key concern for any robotic pool cleaner. We use the scale below to rate the best robotic pool cleaners in our reviews. We also consider customer ratings and reviews on popular retail shopping sites like Amazon.com. Finally, we attempt to offer a few pool cleaners for every type of pool and budget. 2. Is the Hayward Sharkvac really for above ground pools? Nowhere in Hayward advertising do I see it recommended for that use. 2. Re. SharkVac: we selected it for above ground pools because a) it’s inexpensive, b) it’s does a great job cleaning flat surfaces, and c) it is very gentle on all types of surfaces, especially vinyl. I have an above ground pool with a deep end. I tested out a robotic cleaner and it couldnt climb the incline from the deep end. Is there any cleaner out there that will deal with this issue? Sure. The newer Dolphin Premiere and the Polaris 9550 robot pool cleaners can both climb & clean deep-end walls quite well.